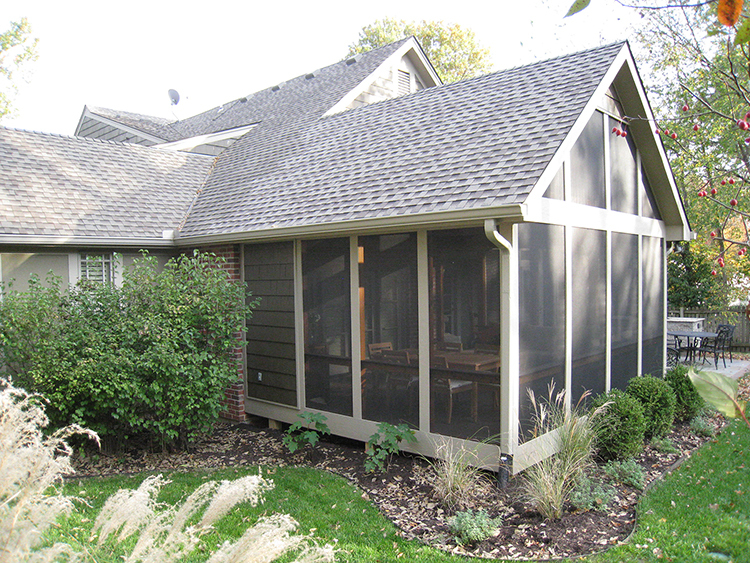 When these Leawood KS, homeowners called us, they were looking for a porch off their master bedroom and also a porch off their primary living area. It’s not unusual for homeowners to request a deck or porch off their bedroom. Most often though, we advise against this. As long-time builders of outdoor spaces, we care not only about building the best looking outdoor space but we also care about building a space that fits how the family wants to live outside. We want to make sure the room is designed to be used for the living functions the homeowners enjoy most. If the homeowners enjoy eating together frequently and want to dine outside, we make sure the porch is designed to accommodate not only room for a table but also room for the right size table depending on whether they entertain often. If the family loves watching sports or television together, we propose solutions to integrate a television in their new space. Whether they want to entertain, read outside or have small family meals outside, we help design the perfect space for them. In addition to ensuring the design accommodates how the family wants to enjoy their outdoor living, access to and from the space is a crucial consideration. Some homeowners may ask for a porch connected to a level of their home that is not the primary living level. 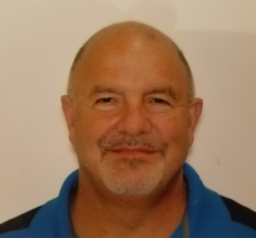 For example, if you have a steep grade drop in your back yard and your lower level basement feeds out into the yard, it doesn’t make sense to build the porch connection at that lower level. Imagine family and guests grabbing a few trays of freshly prepared food ready to move to the porch to enjoy together. Imagine then that they have to go down the stairs to the basement and through the basement before they get to the porch. A similar consideration must be given to having a deck or porch off a master bedroom. While it would be great to roll out of bed and open a set of French doors to take a deep breath of the morning air, you want to make sure that’s not the only way your guests and other family members can get to your porch. In this new porch, notice that this space is large enough to accommodate both eating and seating. 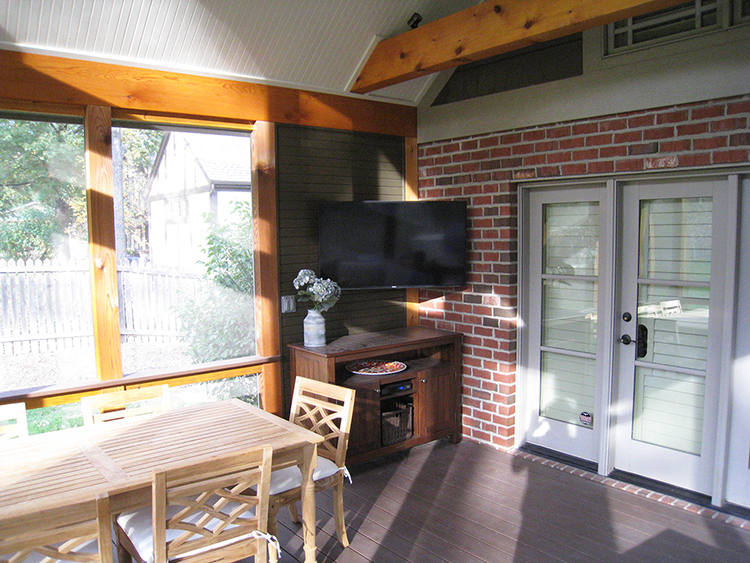 This porch was customized to ensure proper mounting and placement of an outdoor television. The family knew they wanted to watch TV outside so an important consideration was to ensure the television stays as dry as possible. Often times there is a place on the house wall that works well for mounting the TV. If not, we design solutions that will keep the TV dry. 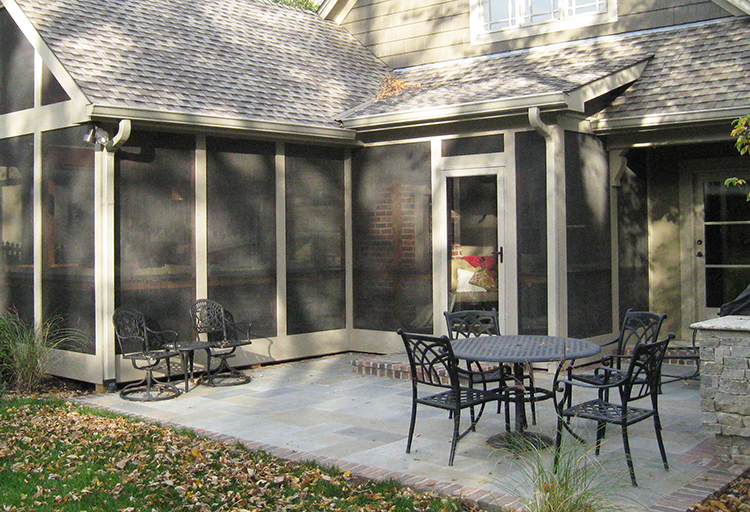 On this porch, one section of the screened area is enclosed creating the perfect protected spot for the TV. Take a look at the close-up picture above to see the porch extension which creates a walkway to the main porch area. The homeowners have their own private access while everyone else has access from the main living area. Perfect! 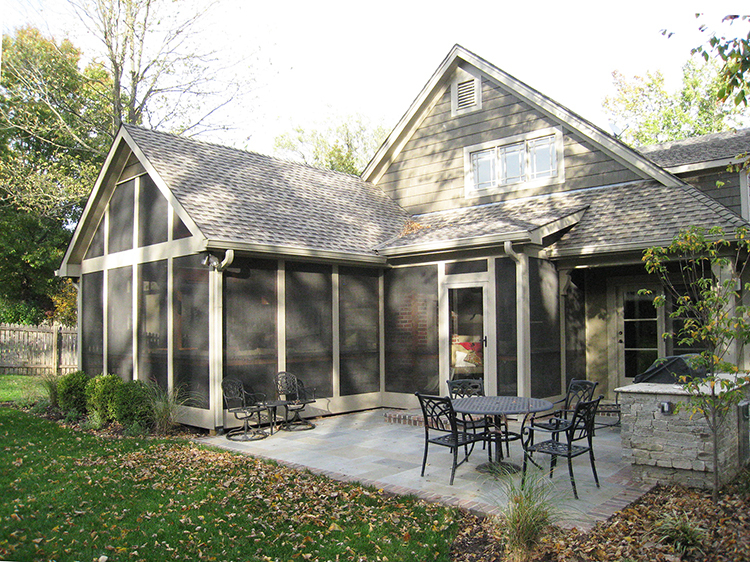 If you are considering adding a porch, outdoor fireplace or other outdoor space to your Kansas City area home, give us a call for a free consultation at (913) 851-3325. Or, drop us an email. We look forward to hearing from you.